Tigh Rosag – Rose's House in Gaelic – is a charming three-bedroom cottage on the beautiful Isle of Barra, situated on the edge of the Western Isles of Scotland. The cottage is situated in the heart of Barra, just a few minutes walk from the village and main ferry terminal of Castlebay. 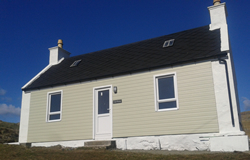 The cottage was newly-refurbished in 2013 and will open its doors for the first time in May 2013. It is run by husband and wife team Ena and John Thomas, who live nearby and maintain the property. The self-catering cottage can comfortably accommodate up to six people and boasts a newly-fitted shower and bathroom, an open plan living, dining and kitchen room and master bedroom situated downstairs. Upstairs are two newly refurbished bedrooms each featuring two single beds. The cottage offers views over Castlebay, the sea and Heaval, the island’s largest hill. Pets allowed and no smoking.